East Nashville prices have blown away previous records recently, similarly to the way much of the neighborhood was whisked away by the tornado of 1998. 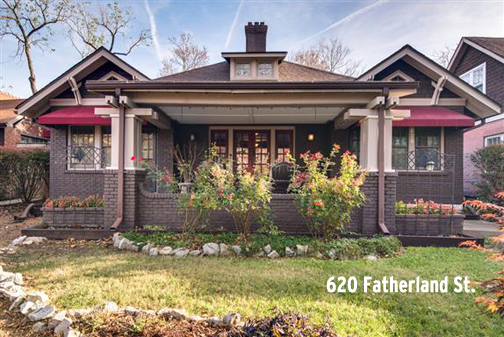 The house at 620 Fatherland is no exception having sold last week for $225 per square foot. With a sales price of $670,000, the 2,976-square-foot, three-bedrooms, three-and-a-half-bathroom historic home scratched several itches for the buyer. Described by the elite, alert Alyse Sands of the firm formerly known as Village Real Estate Services as an “entertainer’s craftsman home,” the dwelling also is private and eco-friendly, Sands says. She listed the house for $699,996, a magical number full of “sixes and nines,” as John Lennon once said. But like sands through the hourglass, so are the days on the market, and Alyse Sands issued a request in her Realtor remarks for someone to bring her an offer. That plea did not fall upon deaf or distant ears, as Village mate Becky Lance heard the plea and delivered an offer. Their company has taken a page from the PARKS – once Bob Parks Realty – playbook and decided that upper case is upper shelf. The company founded by the wise sage Mark Deutschmann shall forever more be known as VILLAGE. This name is not to be confused with Tim Villager, who has opted to keep his name spelled as Villager, not VILLAGER, and his firm, Fridrich and Clark, has proclaimed that it will be neither FRIDRICH nor CLARK and will remain cased in the lower fashion. The Greater Nashville Realtors remain acronymless, following the lead of the Tennessee Realtors, formerly often referred to as TAR, just as the Greater Nashville Realtors was once GNAR. They are not now. They are Realtors. Back to 620 Fatherland. The house on Fatherland has all the amenities a person could desire, such as three distinct suites and a pergola. With its updated kitchen featuring the newest, most solid surface of all time resting permanently upon the cabinetry designed by the mastercraftsperson. Even though the Sands plan was to list and sell for a higher number, $699,960, that price dropped to the $670,00 and, in a strange moment, the seller agreed to pay $3,500. If a person was inclined to wager upon situations, a safe bet would be that the inspection report came in with, oh let’s see, I will guess $3,500 in repairs. The reason is that everyone knows that a person buying a $670,000 house would need $3,500 in closing costs and prepaid items to be paid by the seller, lest they be able to buy the house. Paying $3,500 is better than losing a buyer, especially after 56 days on the market in the most frenetic sales environment of all time. To be sure, these days buyers are walking with their fitbits and apps registering record numbers of steps. Sellers are moaning and groaning and losing sleep and money over these would-be buyers flying away in gaggles. Why are sales evaporating into the not-so-thin Tennessee air? The answer, my friend, is the newest political trend. There is no spirit of cooperation. Both sides feel the other side is conspiratorial. Both sides hate each other. One lies and the other had some emails deleted. The wrong bumper sticker can trigger enough emotion to kill a deal. One party deleted some emails a few years ago and the other party tweets negative remarks. Consequently, anyone who likes either one must be bad. While 60 percent of the human body is water, no one wants any H2O in the crawlspace. Water will breed mold and kill the homeowner. One problem. The homeowner has lived there 39 years and is not dead. So why regrade lots and move dirt to the corners of the universe in order to satisfy an inspector who passed the inspector test. He got at least a D-, as Jean Harrison says. A good plan would be to move to a place with 87 people a day leaving, as that would leave fewer to get to know.